This morning I was thinking about some of the issues I wrote about in an essay published a few years back. For today's post, here's a selection from that piece. I have practiced yoga in some beautiful, almost immaculate studio spaces over the past several years. And I’ve often felt gratitude for the care that’s put in to the upkeep of these places. The same thing can be said of Clouds in Water Zen Center, with its pristine meditation halls and gathering spaces. At the same time, however, it’s become increasingly clear to me how such practice environments reflect the ways in which so many of us are split off from the very earth we are made of. The nearly pristine floors. The rationally ordered props and altars. The air conditioning in the summer. The centralized heating in the winter. The severe lack of wildness. Throughout most of its history, yoga has been practice either outdoors, or within the simplest of structures, designed mostly to protect people from the extremes. And whereas Zen has been long practiced in monastic buildings, monks and nuns traditionally spent much of their day outdoors, gathering materials for cooking, traversing the villages, and even meditating along the roads and in the fields. Something of the depth of wisdom is lost, or difficult to locate anyway, when the practices are cloistered off in today’s tamed environments. It’s really easy to forget, for example, that the Buddha became enlightened while sitting at the foot of a tree. Or that many of the postures we practice in yoga were directly taken from observations of animals, plants, and elements of the Earth. Simply put, humans have become too alienated from our own planet. It’s notable that yogic practices developed around the time this alienation seemed to be forming. Buddhism came later, with Zen forming as an offshoot some 1500-1600 years ago. For all the benefits we have received from agriculture, as well as the development of cities and societies, much has also been lost. The litany of abuse people have unleashed upon the earth, especially in recent centuries, is clearly a sign of deep disconnections, so deep that for some that they might destroy the entire planet in the long term, if it meant big material profits in the short term. Perhaps those early yogis and Buddhists intuitively felt some of this separation occurring. Maybe they were offering a way for people to re-pattern themselves amidst the unhealthy current around them. Given that yoga, and to a somewhat lesser degree Buddhism, remained primarily the domain of men of elite social status until recent centuries, however it’s obvious that some of that separation had already penetrated quite deeply. 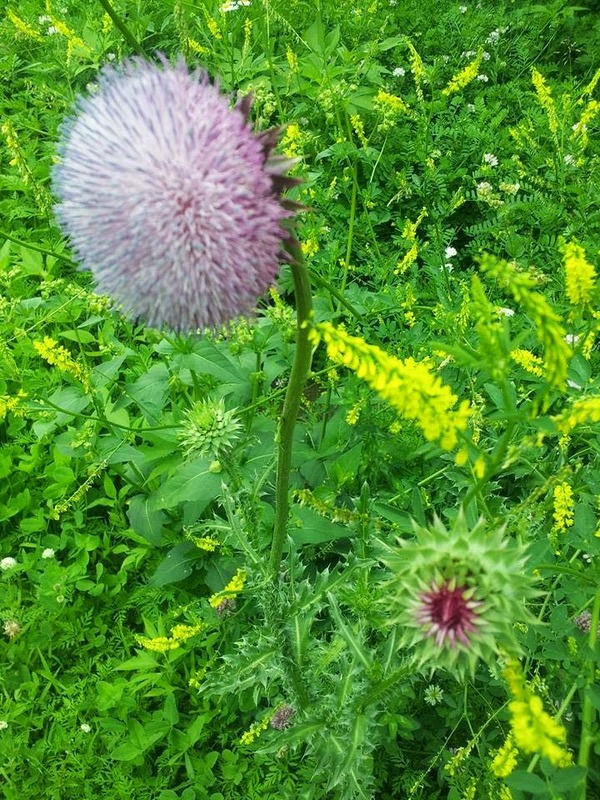 *Photo of Thistles by author. I agree with most of your thoughts but the "oppression of women." Yes women are oppressed but it is women who participate in it as well. Let's take female genital mutilation. Mother's in Islamic countries participate in that. It's their religious dogma that dictates that behavior. There are plenty of female politicians right here in America who take part in oppressing not just women but poorer people. Just because one is female doesn't mean she is more compassionate or morally superior. Take Hilary Clinton for example. I see it as a way to keep us divided and a distraction from the real issues...the uber rich keeping the masses enslaved. I agree we are too disconnected from the earth. Someone from Russia told me years ago that Americans are soft and I tend to agree with him. We are spoiled and at the same time easily duped. We believe we need all these gadgets to live a safe happy life. We don't think long term. If the planet isn't imploding right now, we think it won't happen. If the junk food we are eating doesn't kill us on the spot, it can't be that bad for us. We choose to believe the rhetoric that says we can keep doing what we're doing without consequences because we hate change, even if that change is for the best. And plenty of women involved in decision making are just as bad as the men. Actually, Inge, we're probably on the same page. I totally agree that some women certainly participate in the structures of oppression, and women aren't - by definition - morally superior to men. The way I see it, the collective actions and ideas of men in general, but elite men in particular, over the generations has poisoned everyone else. The Islamic male elite of the past created a lot of anti-women dogma that seeped into the teachings, and is still considered true by a fair percentage of the population. The same goes for Christianity, Judaism, Hinduism, even Buddhism. Counter movements have existed in all of these traditions for generations as well, but the power brokers have been, until recently, nearly all men steeped in patriarchal dogma. As such, it's not really surprising to see female leaders rising to the top with similar values. There has been just enough change to create a more "inclusive" club, but at its heart, it's still the same club. Angela Merkel is probably the most powerful leader in Europe, but no one would accuse her of seeking to radically change the structures and systems, either of Germany or the rest of the world. She's fully invested in capitalism and privatization. Her government has fought against feminist driven campaigns around gender equality. She's spoken out against multicultural society in Germany, taking direct aim at recent immigrant groups that haven't "assimilated." Nothing shocking coming from her administration. Here in the U.S, women like Hilary Clinton have accepted the bulk of the current power structure, and regardless of any cognitive dissonance around gender oppression or anything else, they choose to ride the wave to the top. I think a lot of Americans will again be suckered into some "Hope and Change" show, this time though it will be about electing a female president. I already know a few people who, if Hilary is one of the candidates, plan to vote for her primarily for that reason. In my view, she's no better than her male counterparts in power. But Americans are, on the whole, still stuck in the two party. And your friend from Russia pretty much has the general population pinned, as sad as that is. At the same time, I see Hilary (and Merkel) as embedded in a system that, ultimately, is about keeping her fellow women in line to a certain extent. Just as even though we have an African-American President, the system still ultimately continues to keep the vast majority of African-Americans in check as second class citizens. The few that break through the glass ceiling benefit by maintaining the oppression of the rest. It's important not to underestimate that benefit, and also the safety that comes with it. Mothers participating in female genital mutilation, for example, are doing so - in part - because it's expected. And going along keeps the peace, and keeps them safe. The same is true of male relatives who end up participating in beatings and even murders of female relatives who were raped or assaulted. They're afraid of bucking the system because doing so puts their own lives on the line. Overall, my main point is that interlocking forms of oppression collide to keep everyone playing certain roles. And it's only when enough folks rebel and overthrow those roles that significant societal transformation occurs.